We stopped off in Amsterdam to sort out the 12 volt power adaptor for the computer. They were very helpful at Targus and gave us a replacement. The trip through Germany was uneventful. However, we are having problems with charging the batteries. There are 3, for the car, for the demountable and attached to the chassis (used through Africa) They are all connected with a solar panel for charging that came with the demountable, as well as 210 volt when available, and the engine. The demountable does not seem to be working and Pieter is working on it. We do not want to try the Targus adaptor until the problem is solved. We used rest areas for night stops where 50 Euro-cent is charged for the use of the toilet. Eventually it dawned on us that we were paying 5 Rand per pee! (1 Euro is roughly 10 Rand). It is sometimes difficult not to convert all the prices for a while - not good for our peace of mind. 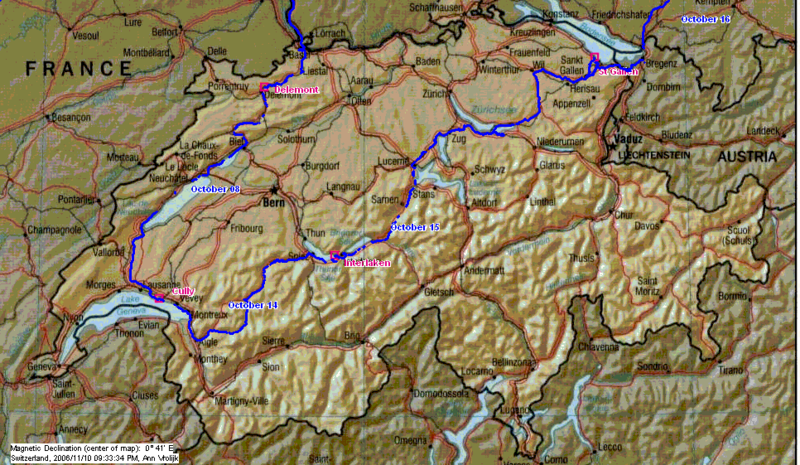 We entered Switzerland through Basel on a quiet Saturday afternoon and headed south through the flatter part of country . Flat is a relative term, hills were up to 100 meters high, small mountains in some parts of the world. We wanted a break and stayed at De Moratel in Cully on Lake Geneva. Our site was right on the lake with a magnificent view of water, mountains, swans, ducks, seagulls, fishermen, swimmers and boats. It was very peaceful. We cleaned the demountable taking off all the stickers, polished it, made small repairs, and reorganized the inside. Twice we walked into the village and bought the most superb meat to braai. We also heard the sounds of the last grapes being brought in. A very happy occasion for the growers and pickers. Unfortunately the Landy would not start when we were ready to leave. Pieter assumed the problem was caused by a malfunction of the immobilizer and even phoned Land Rover in Bedfordview SA to get the overriding code. He was advised to have the car started up by towing, because it was found there is no overriding code for this car. So we followed their advice and that was it. But the problem did not go away, until Pieter found a loose connection to the starter motor. After sorting that out, the engine would start without a hitch. Driving through valleys and over mountains we admired the autumn colours. Unfortunately, just like last year I could not find a suitable spot to take photos, none would have shown just how magnificent the reds, oranges, yellows and browns were. We saw lots of Swiss chalets but the mist obscured most of the views. 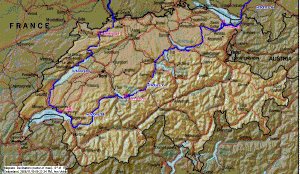 We did not go into the mountains above Interlaken because it is getting cold and we want to head south. Lucern was very busy with tourists. There was absolutely no parking available so we decided to move on. It must be hell in the tourist season. St. Gallen Abbey has a library that was constructed in 1758. It contains books from the 8th to 12th century when scribes wrote beautifully and illustrated their books. I always enjoy looking at these old masterpieces. This morning we went to Bimobil to obtain their stickers. We are so happy with the unit we would like to advertise for them. But against Pieter's intention and expectation we had to pay for the stickers which, in Pieter's mind, was a dumb thing to do. We were charged over 24 Euro, close to R250, for 4 lousy stickers. So we only use two. They also checked the battery connections and told us that the solar panel was not producing sufficient power to charge the battery. We will have to buy a new one..
Innsbrug is in a valley where the mountains go straight up. Nice town but cold. It is time to go south.